The museum, as we know it, is a recent invention. Museums are institutions, open to the public, where we go to see art. There are also museums that specialize in natural history or artifacts of cultural interest, but these are usually housed separately from art museums and their function is manifestly didactic. 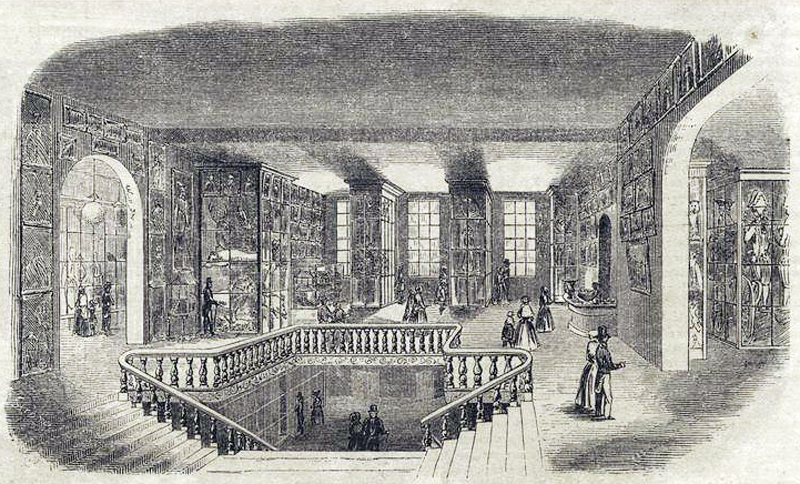 This concept of the museum emerged in the mid-19th century. 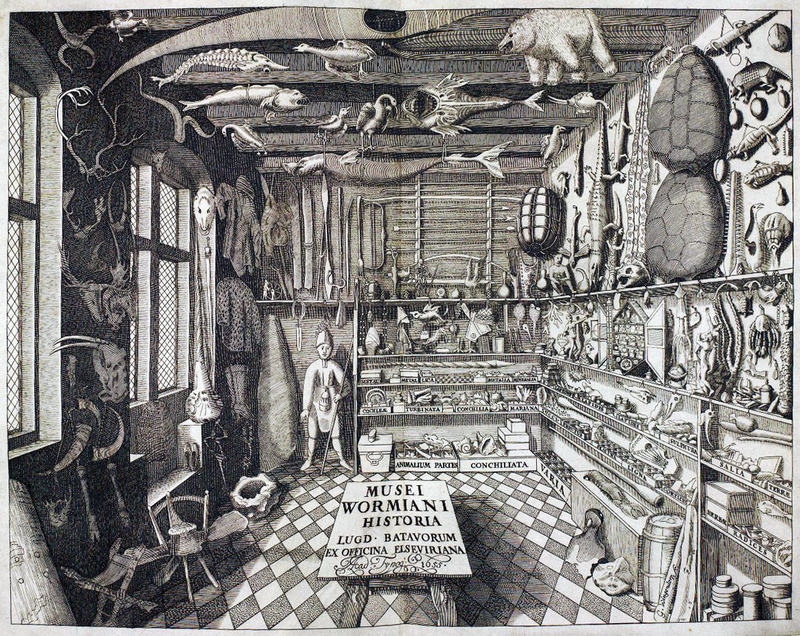 Before that, "museums" were private collections, and they mixed art, artifact, and natural history together. They had some didactic interest, but they were, more than anything, places of curiosity, were people could come see objects that were strange, mysterious, exotic, or even monstrous. 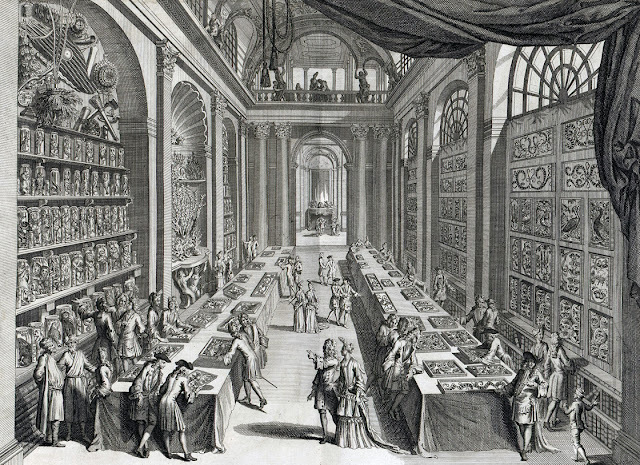 They were called cabinets of curiosity, or in the German, Wunderkammern. 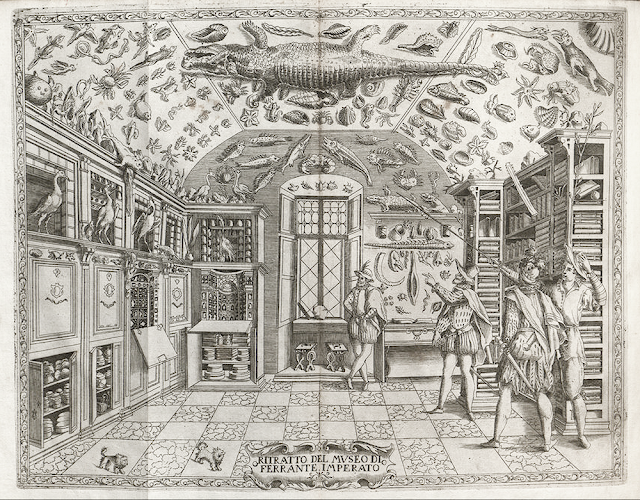 Over the last month, the Grolier Club on East 60th St. in New York hosted an exhibition tracing the 500-year legacy of the Wunderkammer. They assembled some of the most important books pertaining to these collections, with illustrations that give insight into a time when art, science, and a sense of the miraculous were all intermingled. Some of these illustrations are often reproduced, but it was a rare privilege to see the originals. Others were more unusual, and the curators did a fine job of showing how cabinets of curiosity evolved into more modern museums. 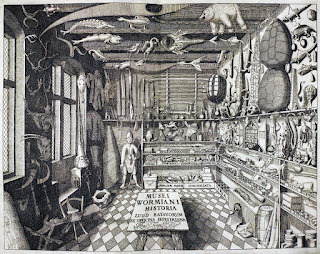 The Wunderkammer concept gained popularity during the Renaissance and spread quickly throughout Europe, with natural philosophers (proto-scientists), noblemen, and explorers amassing enormous collections, which members of the educated classes would seek out with great interest. The Grolier exhibit allowed easy comparison of some important early collections by juxtaposing pictures of each (usually printed as the frontispieces of books describing the collections). Among these were two from Italy: Ferrante Imperato's Dell'historia Naturale (16th c., top) and Lorenzo Lagati depiction of Ferdinando Cospi's cabinet (17th c., above). 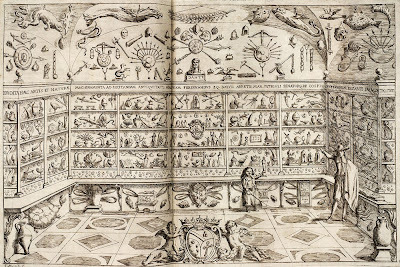 The exhibit also had the classic depiction of Ole Worm's 17th century cabinet, which was once one of the main attractions is Copenhagen (right). Moving into the 18th century, the show has an outstanding image of an important Dutch cabinet: Vincent Levinus's Wondertooneel der Natuur (above). On the left side of this image, you can see shelves of specimen jars, some containing what look like malformed humans. 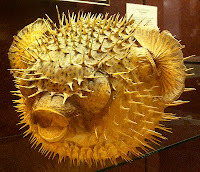 The exhibit also honors another Dutch Wunderkammer. One fine example is the early 18th century plate from Frederik Ruysch, who took special pains to turn his the objects in his collection into lavish display pieces. He was assisted by his daughter Rachel, one of the greatest still-life painters of all time. She would sew eleabrate lacework to adorn severed limbs in here father anatomica preparations. Together, they went well beyond earlier cabinet makers in exaggerate the otherworldly qualities of the anatomical and botanical objects in their collection Click on the image to the left to appreciate a spectacular example, guarded by infantile skeletons . These cabinets may seem a far cry from art museums, since they mostly display animals (specimen jars, bones, shells, fossils, taxidermy, and so on). But some of the items in the Grolier exhibit gesture at a link to art. 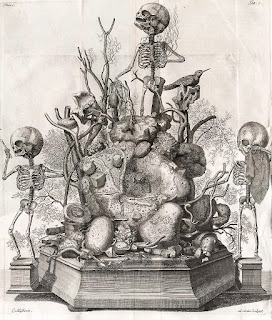 Frederick and Rachel Ruysch provide an example, since their creations can be viewed as sculptures. 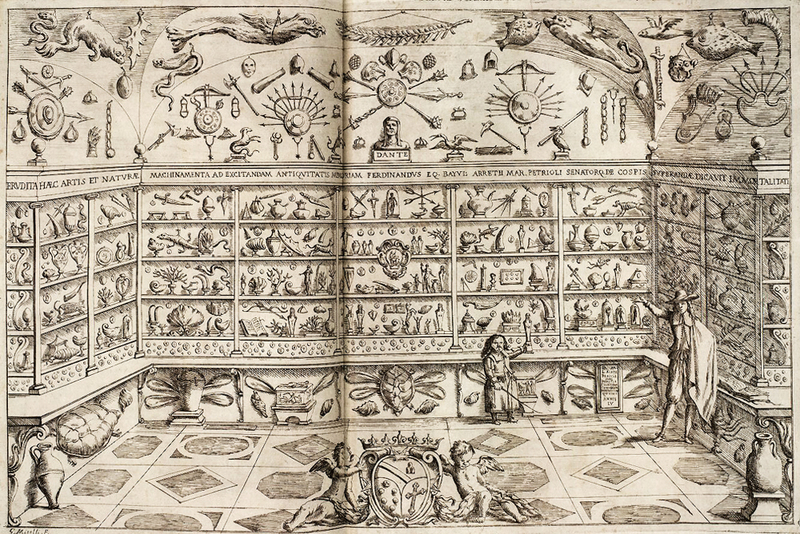 A more direct link to the art museum can be detected in an image from Le Cabinet de la Bibliotheque de Sainte Genevieve, created by Claude du Molinet in 1660 (above). Notice that Molinet combines artifacts with paintings (above). This was not unusual. Guidelines written in this period instructed cabinet makers to strike a perfect balance between naturalia with artificialia. That said, the Grolier exhibit strongly emphasized naturalia. 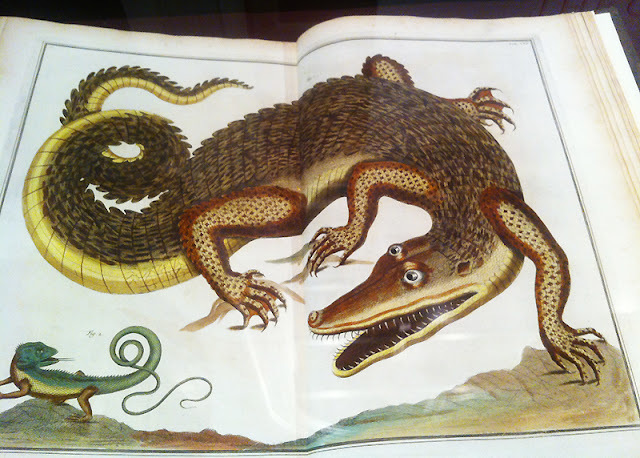 They included some wonderful colored prints by Albertus Sebus (the alligator above was used to advertise the show). 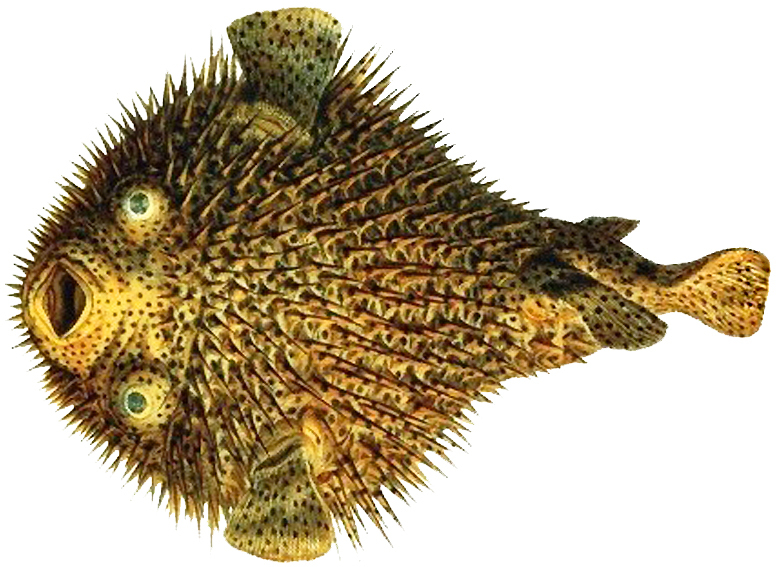 They also included an actual preserved pufferfish, which resembled a Sebus print (below). 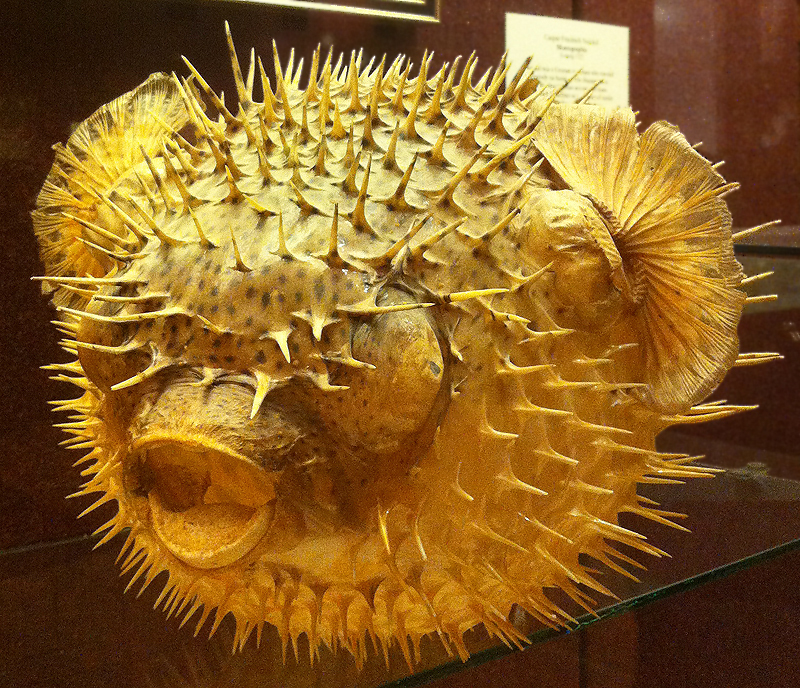 The Sebus pufferfish was not on display but can be found in a lovingly prepared book by Taschen. 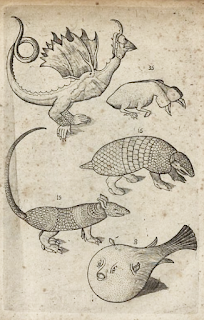 Another puffer appeared in a charming page of creatures from Paul Contant's Le Jardin, et Cabinet Poetique (below right). 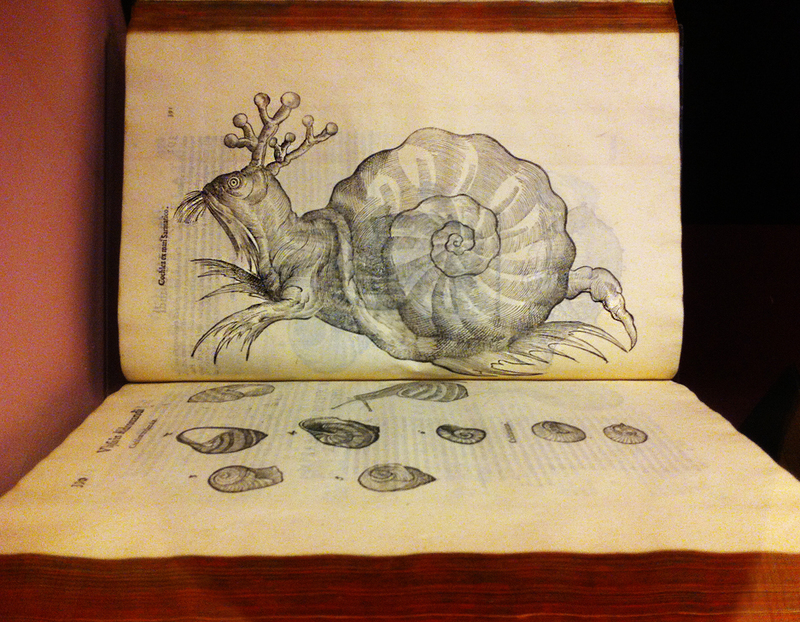 There was also a monstrous snail (below left), and a page or insects from Laurens Theodorus Gronovius, along with some metal insect models (below, as well). It is noteworthy that Wunderkammern did not include any animal specimens they could get their hands on. They selected, instead, creatures that would have been regarded as strange or wondrous. These were places for viewing oddities. It is no surprise, then, that Wunderkammern were a major influence on P.T. Barnum, who opened one of the first major museums in New York, the American Museum, which burned down in 1865. The image below (which was not on display) shows how much Barnum's collection of curiosities resembled Wunderkammer of old, but unlike these, it was open to the general public (there were special hours open for African American visitors). 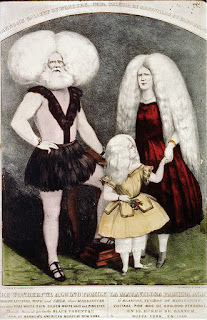 Barnum's institution was a step forward in the modern museum concept, and by opening his doors to all he helped to democratized museum going in the United States. Of course, Barnum was no poster child for egalitarianism or humanism. 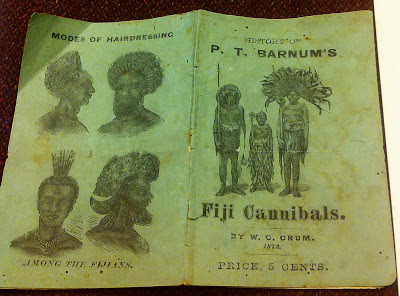 His museum took the Wunderkammer concept to a new level by exhibiting human oddities, such as his Fiji cannibals (see brochure below from the exhibition) and albinos. The image below of an albino family (not in the show) is from a series called "Barnum's Gallery of Wonders"-- a term that echoes the Wunderkammer tradition. Next to that is an image of Barnum's Freejee "mermaid" one of many false oddities that he advertised dramatically to draw crowds. As I've been telling it, this institutional evolution seems to go from the Wunderkammer to the freak show. But what about the art museum? Aside from my mention of du Molinet and Ruysch, that part of the story has been left out. 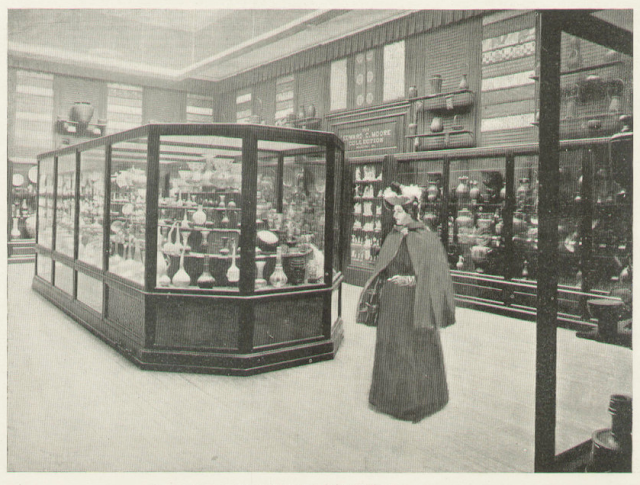 The Grolier exhibition also left some bits of the narrative untold, but it described how the British Museum began to exhibit mummies in the 19th century, which serve as a missing link between odd biological specimens and art. Throughout that century, the British Museum purchased natural curiosities along side ancient artifacts and European paintings, as if these three categories belonged together. Similar acquisitions were made by New York's Metropolitan Museum. I end with a 1897 image from an article in Harper's Bazar found on Ebay) showing a fin de siècle display of artifacts at the Met. 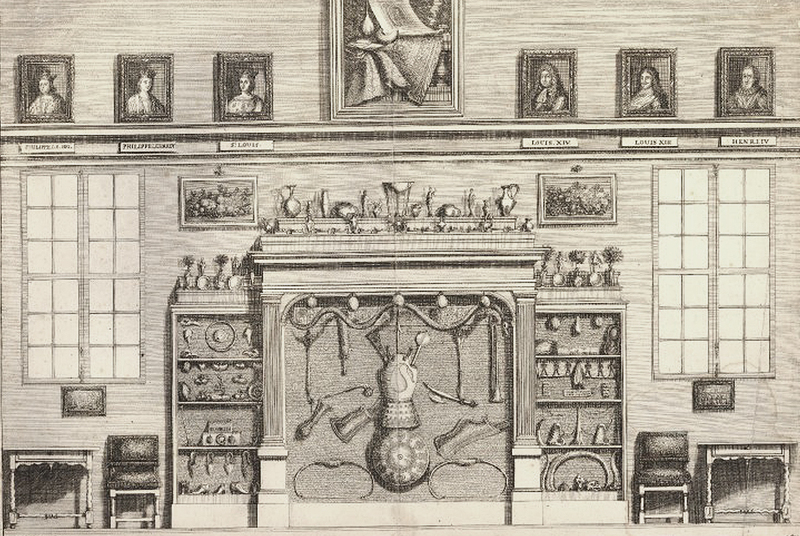 One can see in this chamber of cabinets and walls pilled high with exotic objects a clear residue of the Wunderkammer era. Even now, when we go to see paintings in galleries, we should recognize that this practice is partially continuous with an old tradition of viewing strange and wondrous things. Hey Jessie - Its Rob Torre - Great post! as a lifelong fan of museums in general and specifically AMNH and the Met in New York its fascinating to see some of the history. Look me up sometime! I like museums too. You get out very mentally tired though. From Louvre, for instance. It is too much. I like indigenous australian art. I was very impressed when I first discovered it. It looks original, like anything else. It captures your attention. Seeing patterns everywhere and out of a sudden, not anymore....is this art what it suppose to do, primarily?